AmpliVox calls the suburb of Northbrook, IL, home, and we take great pride in seeing our friends and community members thrive. One of our closest friends, Howard Schultz, has positively transformed the Northbrook and surrounding community during his time as executive director and CEO of the North Suburban YMCA. 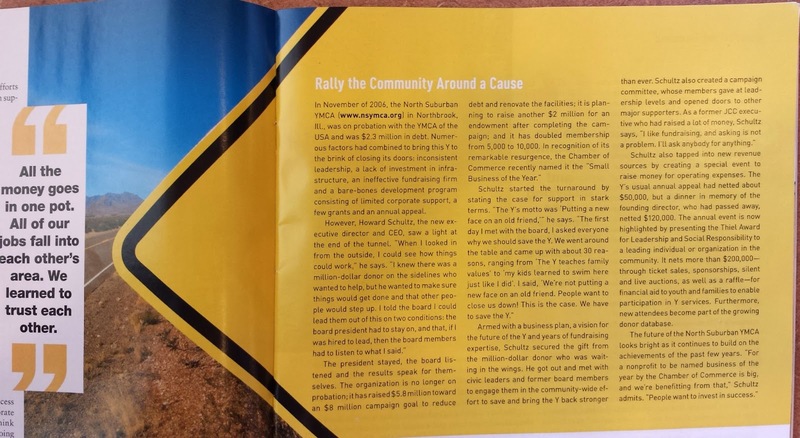 We recently came across a great profile piece of Mr. Schultz from the summer 2013 issue of Advancing Philanthropy that illuminates the steps he has taken to improve the NSYMCA since assuming his role in 2006. He has completely reversed the organization’s financial troubles using strategic fundraising initiatives that have both paid off existing debt and offered new capital for renovations and structural improvements to facilities. He has also overseen the doubling of NSYMCA members thanks to an expanded selection of strong recreational programming for individuals and families. As a symbol of just how far the NSYMCA has come, the organization was named “Small Business of the Year” by the Northbrook Chamber of Commerce for 2013. We congratulate Mr. Schultz on a job well done, and encourage you to read more about his work at the North Suburban YMCA by reading the Advancing Philanthropy article. Click here to read the linked article.